Post updated Jan. 2nd 2014 to fix a bug when items have a background. Of course I wanted to have the cleanest implementation possible, and as I think you already know, this where the WPF behavior comes to the rescue ! Let’s see how this is possible. 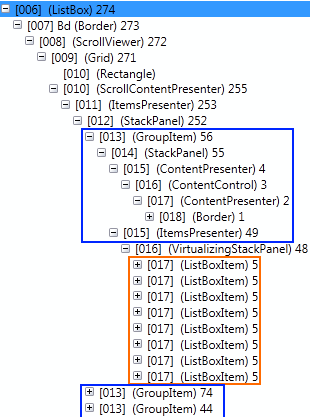 You must be aware that enabling group in your ListBox will disable UI virtualization. This might not be a problem if the databound collections is small (<100/200) but if the collection is very large, you might get into performance problem. However this limitation might be fixed in the next release of WPF (see my post about it here). This solution is not 100% compatible with keyboard selection and should be improved to work properly. As you can see, for each group, we have a GroupItem control. However, we cannot direcly apply a transform to this element because it both contains the header (in a ContentPresenter) and the items in the group (in an ItemsPresenter). The behavior actually walks in the visual tree to find out the interesting part. In our case, we want to attach a TranslateTransform to the headers of each GroupItem. Then, using simple mathematics, we can figure out the needed Y-translation to move the header at the top position of the ListBox. How to attach commands to any UIElement ? In this blog, I already wrote 2 posts about attached properties. The more I play with this new WPF concept, the more I like it. Today at work, I found one new nice use of attached properties, and because it is this time reusable, I decided to share my experience here. Commanding is an input mechanism in Windows Presentation Foundation (WPF) which provides input handling at a more semantic level than device input. Examples of commands are the Copy, Cut, and Paste operations found on many applications. Commands help you to decouple your UI from its execution logic and also simplify the process of enabling and disabling controls regarding the state of the command. If you want more details about Commands, you can check out this nice post from Marlon Grech. As you can imagine, I found a way to do that using… attached properties ! Basically I defined an attached property that I called MouseDoubleClickCommandProperty. This command enables you to attach a ICommand to ANY UIElement that will be triggered when the control is double clicked. The MouseDoubleClickCommandProperty register a PropertyChangedCallback so that when the target changes, I can register on the UIElement.MouseDownEvent event. By looking the ClickCount property of the MouseButtonEventArgs parameter, I can check the MouseDownEvent comes from a DoubleClick event, and then trigger the associated command. As you can see, by using the MouseDoubleClickCommand attached property is becomes possible to attach the command to a StackPanel ! Moreoever, because we might need to pass parameter to the ICommand, I also defined another attached properties that can hold any parameter you want, this is the MouseEventParameterProperty. Similarly, we can imagine to trigger Commands when a RightClick occurs (we would just have to define a new attached property to do so). In my last blog post, I wrote an article about attached properties. Today at work, I encountered a problem that can be solved in a nice way using an attached property. Because the functionality I wanted to implement is also very simple, I decided to blog about it to give a concrete example. I wanted to use a TextBox to allow the user of my application to give a description for any item he selects in a TreeView. Because the TextBox’s content could be changed very frequently by the user, I thought it might be useful to select all the TextBox’s text when the user click in the control (so that as soon as he types something, the old content is cleared). In this article, I will describe various way to implement this feature and I will detail the way I prefer, using of course an attached property !